Code of conduct for electronic media, defacing the press club, justice for slain journalist Shan Dahar and arrests of journalists were the major issues covered by media during the week. 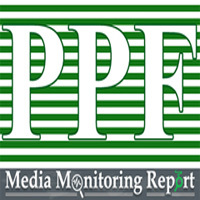 As per Pakistan Press Foundation (PPF) monitoring 25 out of 88 news items were related to Freedom of Expression category, 23 related to media development; 17 were from media regulation; eight news items of ethics; five news items were related to media obituary and two from media safety; while eight news items covered miscellaneous topics. Majority of news maker 71 were males, 12 females; while in five news items gender of spokesperson was not mentioned. The element of fairness was found in 63% news items; however 37% news stories lack fairness. While element of accuracy remained 51% and 49% news stories did not meet the criteria of accuracy. While monitored 27.5% news items were found partial towards one side while 72.5% news stories were impartial. According to monitoring 47% news carried different view points while 53% stories did not accommodate the various view points. The News on January 8 published a photograph which showed defaced murals of respected citizens and rights activists being restored at the boundary walls of Karachi Press Club (KPC) which had been defaced with hateful graffiti by activists of the politico-religious organization during a rally on January 4. A mob of politico-religious organization scrawled messages at KPC boundary walls, they curse media and demanded immediate arrest and execution of Asia Bibi and Shaan Taseer son of Salman Taseer, and also demanded to release their arrested leaders . On January 4 at the occasion of Salman Taseer’s death anniversary, Tehreek Labbaik Ya Rasool Allah (TLY) had arranged two separate pro-blasphemy law rallies. On January 6, The Express Tribune published a news story while daily Intekhab, The Nation, Dawn published photographs of the defaced walls of KPC. Muttahida Quami Movement (London) condemned the incident of defaced murals at KPC boundary walls, reported daily Jang and daily Amn on January 8. Chairman Pakistan Electronic Media Regulatory Authority (PEMRA) Absar Alam announced the authority will soon start interactive sessions with the stakeholders for improving code of conduct on electronic media with the title, “The code of conduct, a collective responsibility”. The purpose of this initiative is to have an open discussion on Electronic Media Code of Conduct 2015, to get feedback from the relevant stakeholders on improving the regulatory function of the PEMRA and to bridge the gap between the regulatory authority and its relevant stakeholders. The panel discussions are namely “Media: Independent but Less Responsible? “Fake Images and Fake News: How Social Media is Affecting Journalism” and “Ratings vs. Truth: Does Pakistani Electronic Media follow professional standards?” 92 News, Abb Takk, ARY News, Capital TV, Express News, Jaag TV, News One on January 6 aired tickers, breakings news while The News, The Nation, The Express Tribune on January 7 reported the story. The News on January 7 published a news analysis written by Mian Saif-ur-Rehman covering the issue of Lahore High Court’s (LHC) decision to annul PEMRA’s bidding process. The judgment of LHC that declared broadcasters eligible for DTH satellite TV licences is an important guideline to PEMRA to correct its policy since 2009. PPF and slain victim Shan Dahar’s family demanded government to re-open Dahar’s murder case. His sister Fauzia while addressing the press conference at Karachi Press Club (KPC) said Shan’s killing was targeted because of his stories on the illicit sale of medicines donated by NGOs in a local hospital and his killers are roaming and hurling dire threats of killing her for pursuing the murder case of her brother. They demanded Sindh Government to give announced money for his children education, reported Regional Times on January 4. As per another story Fauzia along with martyred journalist’s daughters Aalia and Raina arranged a condolence ceremony on the 3rd death anniversary of Dahar at Larkana Press Club. Speakers demanded justice for journalist and also criticized delays in inquiry, reported Regional Times, daily Dunya on January 2; while daily Intekhab reported the story on January 3. Imdad Phulpoto, Samaa’s station head in Sukkur was released on January 5, after being beaten, tortured and detained by police. In the morning of January 5, Phulpoto along with his brother and cousin were beaten and arrested by Khairpur Police led by SSP Imran Mirza. ARY News, Geo News, Samaa aired tickers, breakings news and programs on January 5; while daily Intekhab on January 7 reported the story. The motive behind arrest was not mentioned by channels and newspaper; however Samma claimed that ruling party persons were behind the victimization of the reporter. Reporter M. Azeem Sarwar and Bureau reporter Atif Imran Baloch of a private TV channel were beaten by Rafique Bandeesha, when they reached in front of their office building. Khanewal Press Club president Sajid Parveez condemned this act and demanded CM Punjab, RPO Multan and DPO Khanewal to arrest involved suspects and punish them, reported daily Nawa-i-Waqt on January 4. Motive behind attack, details of accused and the name of TV channel was not mentioned by the newspaper. A free lance video journalist of Khairpur, Sirajuudin Shahwani was arrested on January 3 for his reporting over poor performance of police. Local journalist Ghullam Qadir Soomro, Sanaullah Memon, Khan Muhammad Solangi, and Mithal Khuhro recorded their protest against police for arresting their colleague and demanded officials to take notice of this matter; otherwise they will expand their protesting circle, reported Regional Times on January 4. Lahore High Court (LHC) issued notice against printer and published of Jang Group Mir Shakeel Ur Rehman, Javed Ur Rehman and columnist Ansar Abbasi over the news story published in 2009 on Nanhoo Goria and Justice (retd) Bilal. LHC said, Justice Bilal was given clean chit by the court and the report was published on baseless facts and contempt of courts whoever scandalize judiciary must submit explanation over it. LHC Chief justice Syed Mansoor Ali Shah observed that the court could not stay silent while the judiciary is being scandalized, listening to a petition by Mazhar Ali and others, reported ARY News channel and The Express Tribune on January 5. Study titled “surveillance of female journalists in Pakistan” conducted by digital rights foundation states that public keeps closer watch on Female journalist than state. State surveillance is more systematic and efficient monitoring and social surveillance audience, political parties, non-state actors, fellow journalists and personal contacts. According findings, women journalist face as same difficulties as male journalist, people more focus on appearance, character and discourage women. This study recommended that state and media organizations take safety measures to protect female journalists towards this serious issue, published in Dawn on January 2. Pakistan Today published an article with the title “Sensationalism in electronic media” written by Abuzar Salman Khan Niazi, media plays a significant in any society and fourth pillar of the state but unfortunately Pakistani media especially electronic media not full fill their responsibilities and exaggerate the issues or news that much time damages Pakistan image and portray wrong perception among the audience. Most of the TV channels and Anchors only chase higher ratings. Dawn published an editorial entitled “Media Freedom” on January 2, according to CPJ annual report 2016, “did not identify anyone singled out for murder in Pakistan because of journalistic work” but it’s not mean there have been no targeted murder in country. In August, Dawn News cameraman Mehmood Khan and Aaj TV cameraman Shehzad Ahmed were killed in a bomb blast at the Quetta Civil Hospital while the coverage of murder of the president of the Balochistan Bar Association. Dawn on January 7 published an editorial entitled “Extremism Unchecked” which discussed the defaced murals at Karachi press club‘s boundary wall. In October 2016, a group of artists, painted those women who played a significant role in the society. The painting had been defaced with hateful graffiti by activists of the politico-religious organization during a rally on January 4. Annual elections of Qazi Ahmed Press Club (Qazi Ahmed, a town in Shaheed Benazir Abad District, Sindh) and Thar Press Club, Mitthi also held, reported daily Express, daily Nawa-i-Waqt on January 2 and daily Jang on January 3. While on January 3, daily Pakistan and January 6 The Nation reported the, oath taking ceremony of newly elected members of Badin Press Club and Shikarpur Press Club. Senior journalist Ahfaz-ur-Rehman‘s book second edition book titled “Sab Say Bari Jang” (The Biggest War), which narrates the struggle of journalist’s movement in General Ziaul Haq’s era 1977-1978. “During the movement 523 people were arrested which included journalists, human rights activists, political workers and labour leaders. The people arrested were prosecuted in military courts and four of them were flogged publically”, reported daily Dunya, daily Nawa-i-Waqt on January 7 and Dawn on January 8. Syed Ghazan­far Uddin, a journalist and former senior sub-editor of Dawn, passed away on January 5. Mr Ghazanfar joined Dawn in 1978 and served the organization till 2002, reported Dawn on January 6. Senior journalist and editor coordination of The News Rauf Shaikh passed away on January 7. He started his journalistic career from The Pakistan Times, in the early 1980s; he had been working with The News since 1991. Geo News and The News on January 8 reported the story. A condolence reference was held over the demise of journalist Ishrat Khan, organized at Moro (Naushehro Feroze District) Press Club under supervision of president Arshad U Khan, reported Regional Times on January 3 and daily Dunya on January 4. PPF monitored 33 items out of which there were 19 tickers, six detailed news, four breaking news, three programs and one headline related to Pakistani media that were covered in the following television channels: 92 News, Aaj News, Abb Takk, ARY News, Capital TV, Dawn News, Dunya News, Express News, Geo News, Jaag News, Neo News, News One, Samaa and TV One. Out of 55 news items there were 26 events coverage, 11 press releases, six press conferences, four photographs, three press briefings, three opinions, one interview and one analysis published in English and Urdu dailies including Dawn, The News, The Nation, The Express Tribune, Business Recorder, Pakistan Today, Regional Times, Balochistan Express, daily Jang, daily Dunya, daily Express, daily Nawa-i-Waqt, daily Intikhab, daily Amn, daily Pakistan.